Difficult process, “looks” bad as many people dread, but the music is raw fish ideal for processing specialties, captivates diners. That’s music fried fish. Quang Ninh to travel must have seafood market visitors will encounter this kind of fish. Personal selling affordable prices from 50,000-60,000 VND / kg. Personal music at first glance like a snake or eel, “information minister” with thick teeth, body length 50-60cm. According to Tong Cuong Bui, a senior fisherman fishing on the Bay, said: This is pretty special marine fish, catfish species, habitats offshore, deep water below. Fish can not feed, meat tough, very appropriate as rolls, a specialty which is very famous in Halong. 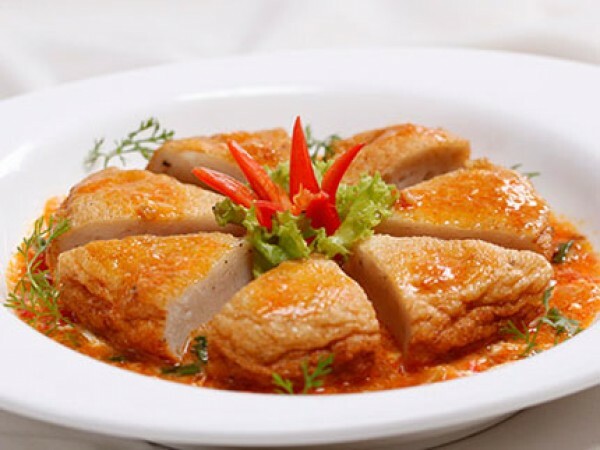 For music delicious fried fish dishes nực the freshest ingredients is required should preferably choose a new fish to be caught and processed within a day. Fish after being washed, drained, who will carry out filtering processing fish, remove bones, meat. Perhaps this is the most difficult stages in both stages as fried fish. At first glance these workers will see their music as individuals “handle” easily, gently like … an artist! But individuals need to filter own ingenuity, is used to filter individual knives must be sharp, thin blade and hard. Workers to keep fish head tilt, look sharp knife pull a line, fast, close, spine extract the meat section. The body of the other fish are also filtered analog audio meat, remove the spine and head. Then, workers without the skin, fish out the meat. Raw material after being crushed and fried squeeze brought. Vermicelli rolls are molded each round, the size of your palm. Hand rolls are to be molded, no cracks to make sure you put it in the fried patties is not broken. Fish must be deep-frying music, just right to fire fishcakes natural yellow color. Fishcakes both sides cumbersome ripe, fragrant, aromatic taste of fish and squid music, the days of fat, served with hot rice in the cold season there is nothing more wonderful.